“For as the body apart from the spirit is dead, so also faith apart from works is dead” (James 2:26). In the opening verses of his epistle, James, the brother of our Lord, calls us to rejoice in trials because they strengthen our faith and cause us to persevere (1:2–4). While we may know this to be true, so often we pay only lip service to this teaching, thinking that those who lived during the apostolic age found it easier than we do to evidence their profession with their good works. However, our study of James has shown us that those who lived long ago also had difficulty living according to Christ’s law even while professing allegiance to it. Like Christians today, the original audience of this letter endured many trials. Yet instead of embracing these trials with joy, they began to act in ways inconsistent with their profession. They questioned the goodness of God, thinking that He was tempting them to sin (vv. 12–18). Their zeal to live according to God’s wisdom was soon replaced with a pattern of life reflecting the wisdom of this fallen world. As a result, they became quick to speak (vv. 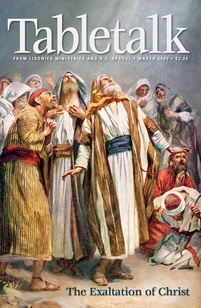 19–21), often letting their tongues run wild and curse their fellow believers (3:1–12). Just like this sinful world, they exalted those with great wealth at the expense of the righteous poor (2:1–13) and even began to boast in their riches rather than in their position in Christ (1:9–11). Without mincing any words, James called this audience to repent of such behavior (4:1–12) and warned of judgment against those who would use their wealth to oppress the poor (5:1–6). With a pastor’s heart, he called upon them to respond to their trials properly by seeking God’s wisdom (1:5–8) and then to reflect this wisdom in their care for the poor (v. 27), their planning for the future (4:13–17), and their exercise of the tongue in patience (5:7–12), prayer (vv. 13–18), and exhortation (vv. 19–20). As we conclude our study of James today, we note that only by God’s wisdom can we do these things (3:13–18). And do them we must, for these good works not only show that we possess heavenly wisdom, they also show that we have true faith (2:14–26). If we confess Christ without doing good works, our profession is revealed to be inauthentic and, therefore, not effectual for salvation. Take some time today to read through the book of James and meditate on his command to be a doer of the Word (1:22). Ask for God’s wisdom to help you do this, for without it, we will never be able to have an authentic faith that professes Christ in both word and deed. As you read and find areas where you have been lax in your service, ask God to make you one who faithfully trusts Him in the doing of good deeds. Then, go and do them.